Audi A7 Advert Song - Where Next? Audi continues its recently launched ad campaign promoting the new A6, A7 and A8 models in the UK with a new spot. Titled “What Next?”, the advert looks forward to the future, highlighting that “It’s not what you’ve done, it’s what you do next”. The protagonist is a man who leaves his desk job in a corporation to start his own business. Motivated by the desire to spend more time with his wife and daughter, he starts working as an architect and his career evolves to the point where he is asked to go speak in front of college students. The A7 Sportback also takes centre stage, as it is used by the protagonist to go to his next destination. The soundtrack music is a cover of Fleetwood Mac’s 1977 single “Don’t Stop” performed by Faultline with Bat for Lashes. After being unveiled late last year, the all-new 2019 Audi A7 made its first auto show appearance in January 2018. The 2019 A6 and A8 have also been advertised by the automaker in other spots, focused on the available technologies and the luxurious interiors. 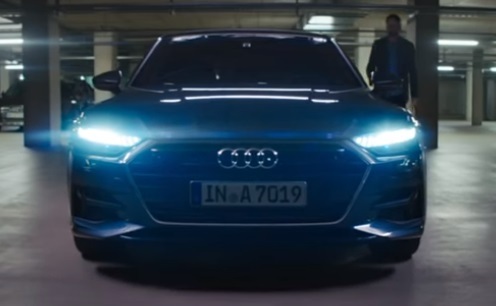 One of them, titled “The AIs are coming,” features the Audi A7 and A8 models, with focus on technologies like HD Matrix LED Beam, Active Lane Assist, Virtual Cockpit, Quattro All-Wheel Drive, Audi Pre-Sense Cross-Traffic Assist Rear, Adaptive Cruise Control and Park Assist, which are available as options. The other one, promoting the luxurious interiors of the brand’s A6, A7 and A8 models, follows a man involved in a fight between two rival gangs, who manages to escape the clutches of a henchman. Arrived in a parking lot, he hides in the back seat of an Audi A8, where he discovers an interior boasting modern technology, a touchscreen, foot massage and even a glass of champagne, while in the background Commodores’ 1977 single “Easy” (from the band’s fifth album, “Commodores”) is playing.